About once a year we can be assured that we’ll start fielding inquires to this effect, as the third and fourth brightest natural objects in the sky once again meet up. We’re talking about a conjunction of the planets Jupiter and Venus. 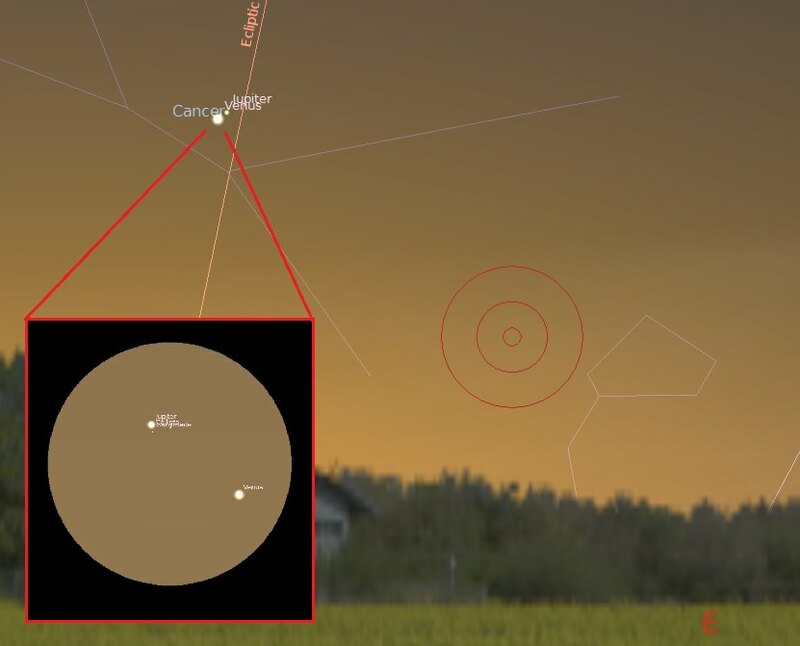 Venus has been dominating the dawn sky for 2014, and Jupiter is fresh off of solar conjunction on the far side of the Sun on July 24th and is currently racing up to greet it. We just caught sight of Jupiter for the first time for this apparition yesterday from our campsite on F.E. Warren Air Force Base in Cheyenne, Wyoming. We’d just wrapped up an early vigil for Perseid meteors and scrambled to shoot a quick sequence of the supermoon setting behind a distant wind farm. Jupiter was an easy catch, first with binoculars, and then the naked eye, using brilliant Venus as a guide post. The view looking eastward at dawn on August 18th, including a five degree telrad (red circles) and a one degree telescopic field of view (inset). Created using Stellarium. And Jupiter will become more prominent as the week progresses, climaxing with a fine conjunction of the pair on Monday, August 18th. This will be the closest planet versus planet conjunction for 2014. At their closest — around 4:00 Universal Time or midnight Eastern Daylight Saving Time — Venus and Jupiter will stand only 11.9’ apart, less than half the diameter of a Full Moon. This will make the pair an “easy squeeze” into the same telescopic field of view at low power. Venus will shine at magnitude -3.9, while Jupiter is currently about 2 magnitudes or 6.3 times fainter at magnitude -1.8. In fact, Jupiter shines about as bright as another famous star just emerging into the dawn sky, Sirius. Such a dawn sighting is known as a heliacal rising, and the first recovery of Sirius in the dawn heralded the flooding of the Nile for the ancient Egyptians and the start what we now term the Dog Days of Summer. Earth meets Venus, as seen from Jupiter on August 18th. Note the Moon nearby. Created using Starry Night Education Software. A list of Venus and Jupiter conjunctions, including angular separation and elongations (west=dawn, east=dusk) from now until 2020. Created by author. Venus has been the culprit in many UFO sightings, as pilots have been known to chase after it and air traffic controllers have made furtive attempts to hail it over the years. And astronomy can indeed save lives when it comes to conjunctions: in fact, last year’s close pairing of Jupiter and Venus in the dusk sky nearly sparked an international incident, when Indian Army sentries along the Himalayan border with China mistook the pair for Chinese spy drones. Luckily, Indian astronomers identified the conjunction before shots were exchanged! Earth strikes back… firing a 5mw green laser at the 2013 conjunction of Jupiter and Venus. Photo by author. Next week’s conjunction also occurs against the backdrop of Messier 44/Praesepe, also known as the “Beehive cluster”. It’ll be difficult to catch sight of M44, however, because the entire “tri-conjunction” sits only 18 degrees from the Sun in the dawn sky. Binocs or a low power field of view might tease out the distant cluster from behind the planetary pair. And to top it off, the waning crescent Moon joins the group on the mornings of August 23rd and 24th, passing about five degrees distant. Photo op! Can you follow Venus up into the daytime sky, using the Moon as a guide? 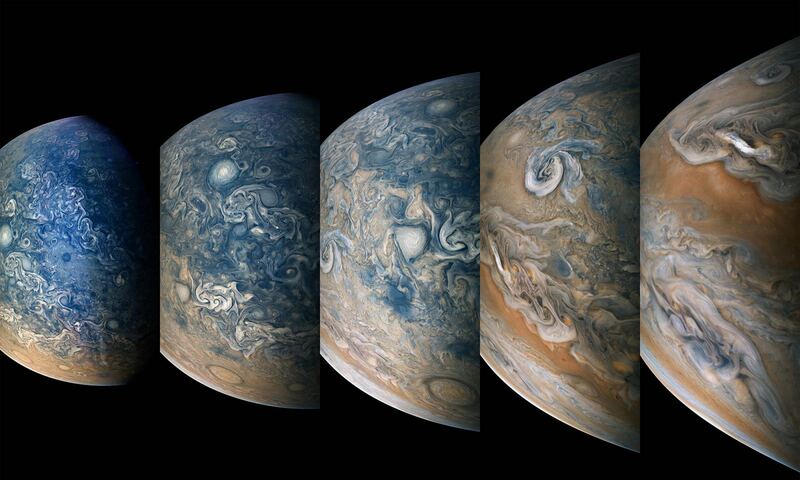 How about Jupiter? Be sure to block that blinding Sun behind a hill or building while making this attempt. The Moon photobombs the conjunction of Venus and Jupiter on the weekend of August 23rd. Credit: Stellarium. The addition of the Moon will provide the opportunity to catch a skewed “emoticon” conjunction. A rare smiley face “:)” conjunction occurred in 2009, and another tight skewed tri-conjunction is in the offering for 2056. While many national flags incorporate examples of close pairings of Venus and the crescent Moon, we feel at least one should include a “smiley face” conjunction, if for no other reason than to highlight the irony of the cosmos. A challenge: can you catch a time exposure of the International Space Station passing Venus and Jupiter? You might at least pull off a “:/” emoticon image! Don’t miss the astronomical action unfolding in a dawn sky near you over the coming weeks. And be sure to spread the word: astronomical knowledge may just well avert a global catastrophe. The fate of the free world lies in the hands of amateur astronomers!